Bryce Canyon National Park in Utah is a terrific side trip from Zion National Park, where we spent three days in late August. Being at the higher elevation of Bryce brought a respite from the heat of Zion as well as new and different sights, particularly the world-famous collection of hoodoos. I’d seen plenty of photographs of the hoodoos prior to the trip, but it takes being there to realize the immense beauty of the scenery. It’s a different type of beauty than the lush grandeur of Zion — more dry and alien — but also breathtaking. One to two days is all you need to get a taste of this spectacular national park. We stayed one night at the Best Western Plus Bryce Canyon (not to be confused with the Best Western Ruby's Inn), just a few minutes from the park entrance, and it seemed to be the nicest option in the area. The hotel's interior was designed to resemble a grand lodge, and there are little details that made us feel at home, including a heated outdoor pool, free breakfast, and a laundry room. Plus, the management was super nice about us canceling a night of our stay (without penalty) on account of the weather, even though I was asking the morning of. 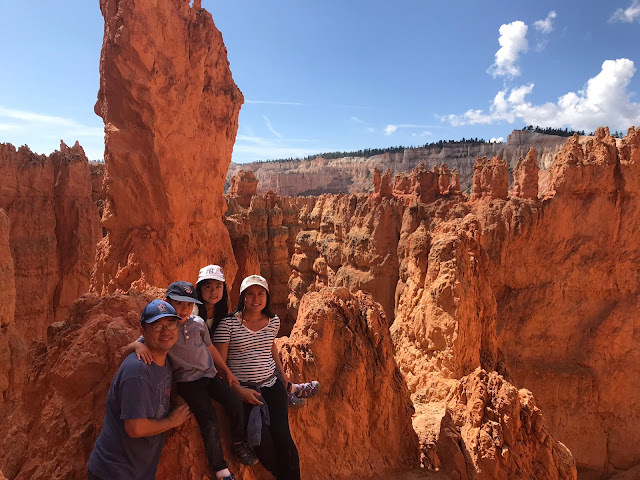 We started off our visit by getting an overview of Bryce's main attraction — the display of hoodoos in the canyon — by hiking the Rim Trail. 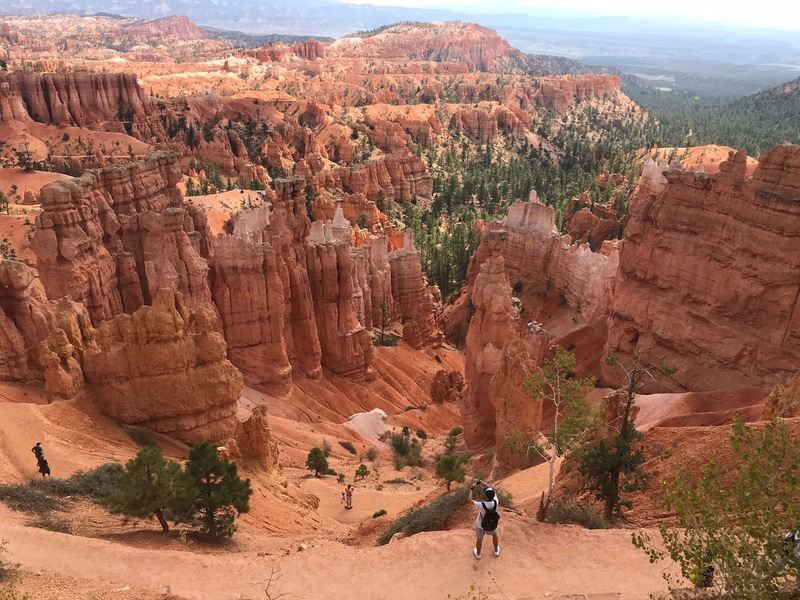 The whole trail is 5.5 miles long and runs along the rim of the canyon, giving you an opportunity to view it from above, but we only hiked the most popular section, from Sunrise Point to Sunset Point, which is only half a mile (map here). If you don't want to hike back to your car after reaching Sunset, you have the option of hopping aboard the park's shuttle bus for a free ride back. After getting a sense of the canyon from above, we went on a hike that took us right into it. The Queen's Garden Trail and Navajo Loop combination is just under 3 miles long, and is a stunning experience that descends into the canyon and brings you up close to the hoodoos. Parts of the trail bring you right up against the ledge, so hold onto your kid's hand! Hiking in is all downhill, of course, depositing you on the canyon floor, where it's cool and shaded by different varieties of pine trees. It's the climbing out that's the challenge, but the experience of switch-backing up Wall Street (the final leg of the Navajo Loop) is so amazing that you almost forget how hard you're working your legs! 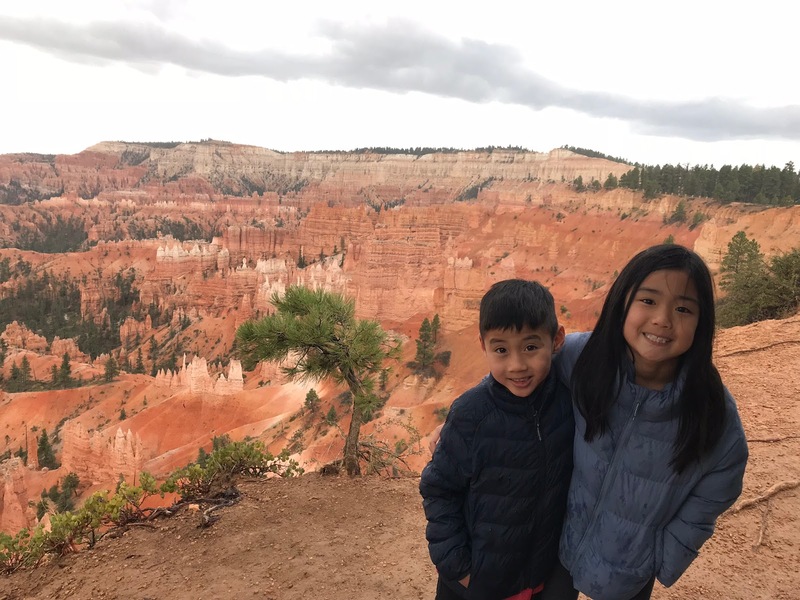 If 3 miles is too long for your kids, opt for just the Navajo Loop (1.3 miles), which is the more dramatic — and steepest — portion of the hike, and also offers you prime views of Thor's Hammer, the park's mascot hoodoo. Another way to experience the hoodoos is on horseback. Canyon Trail Rides takes you right into the canyon on a two- or three-hour ride (kids must be at least 7 to do the shorter ride). We'd already done a trail ride in Zion on this trip so we didn't book this tour, but after watching a line of riders pass us on their way into the canyon, I kind of wished we did. Some rain on our trip prevented us from doing all the things we had planned for Bryce. 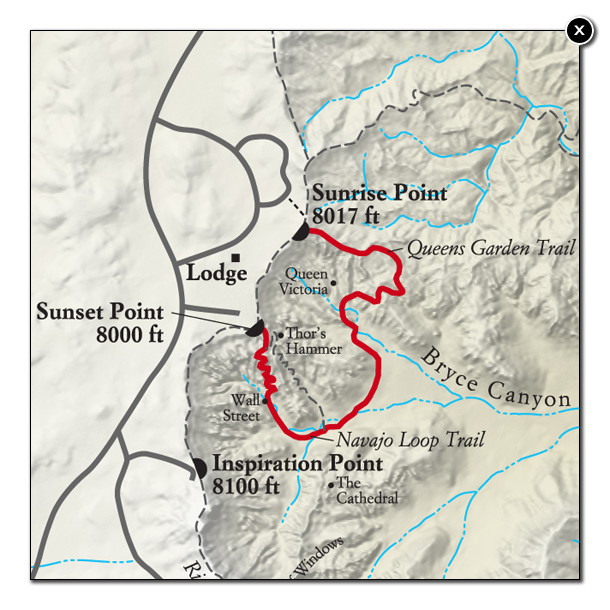 One thing on my itinerary that we didn't get to do was the drive through the entire park (about 35 minutes one way; map here), with a stop at Rainbow Point to hike the one-mile Bristlecone Loop. Another activity was the astronomy presentation that the rangers offer on Thursday and Saturday evenings, where you can use high-powered telescopes to examine the night sky. Oh, well; next time! For a fun activity in the area, I recommend the dinner and show at Ebenezer's Barn and Grill. You eat a barbecue buffet meal while listening to live country music being performed on a full-size stage, and the musicians are quite talented. We got to hear classics by Dolly Parton, John Denver, Neil Diamond, Patsy Kline, and more. The band put on a high-quality show, particularly the fiddler. I'd been expecting something more hokey and geared toward children, but it was more like an adult concert that the kids also happened to enjoy. At one point, they were invited up to the stage to dance to a song. The food is by no means fine dining, but it was tasty enough and something different from the rest of the offerings in the area. It was a fun and relaxing way to spend an evening. In addition to nearby Zion National Park, the town of Page in Arizona makes a great day trip from Bryce Canyon. That's where you'll find Antelope Canyon (technically in the Navajo Nation of LeChee), a sandstone slot canyon that needs to be seen to be believed. Here are my family-friendly itineraries for Page and Zion.